Don't underestimate the power of coconut milk in baked goods: this bundt cake is the stuff dreams are made of. The coconut flavor is subtle, and you'll be blown away by the rich graham cracker swirl. It's like if a s'more and the best coffee cake you've ever had had an extremely chubby baby. Don't be afraid of bundt cakes! They look fancy, but they're actually way easier than your standard layer cake. And there's no pesky frosting between layers to worry about. I use a rolling pin to crush my graham crackers in a huge Ziploc bag. Pop your buttered/floured bundt pan in the fridge for a few minutes while you're mixing the batter. This will help it pop out of the pan more easily later! Want more coconut flavor? You can swap one teaspoon of the vanilla extract for one teaspoon of coconut extract in the cake batter. But, I don't think you'll need this! 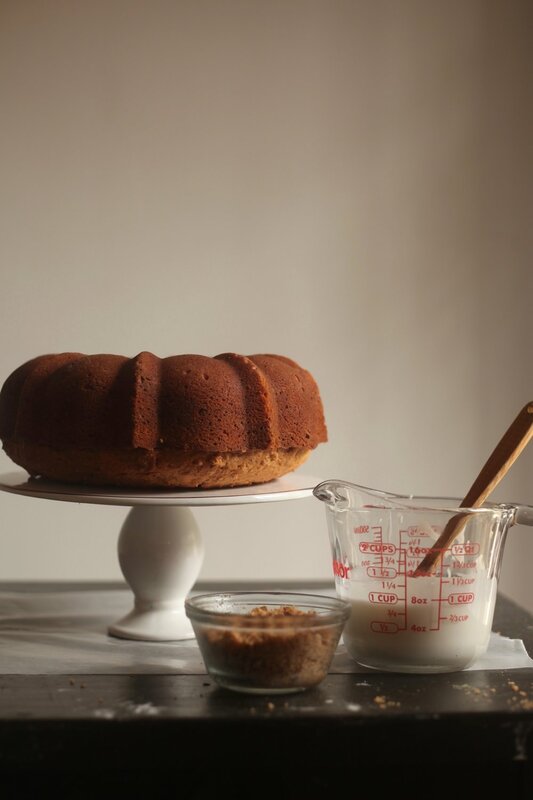 Lay a piece of parchment paper under your cake stand before drizzling for easy glaze clean up. Preheat the oven to 350 degrees. Coat your pan thoroughly using 1 tablespoon softened butter. Sprinkle flour evenly over the pan, then tap out the excess. Very important note: coat every single nook and cranny, and then coat them again. In a medium bowl, whisk together the flour, baking powder, baking soda, and salt. In the bowl of an electric mixer, cream the butter and sugar on medium speed until very light and fluffy (about 3 minutes). Beat in your eggs one at a time, making sure to fully incorporate before adding the next one. On low speed, mix in the vanilla extract and half of the coconut milk, then half of the flour mixture. Mix in the rest of the coconut milk, then add the second half of the flour mixture. Mix just until combined. In a medium bowl, combine your graham cracker crumbs, brown sugar, cinnamon, and melted coconut oil. The mixture will be crumbly (don't expect liquid!) Set aside 2/3 cup of the graham mixture to use later. Pour 1/3 of the cake batter into the prepared pan, then drop in spoonfuls of the graham cracker mixture all around the batter. Using a skewer or chopstick, marble the swirl in using a figure 8 motion. Repeat two more times, with the remaining batter & graham cracker mixture. Smooth the top. Lightly tap the pan on the counter a couple of times to eliminate air bubbles. Bake cake at 350 degrees for 55-60 minutes, or until a toothpick comes out clean. Allow cake to cool in the pan on a wire rack for at least 30 minutes (but you'll be less stressed if you can give it 45 minutes). Gather your courage, tap the pan a few times on the counter to loosen the cake, then invert it onto the rack. Let cool completely (about an hour). In a small bowl, combine powdered sugar, coconut milk, and softened butter. Stir until smooth. Once the cake has cooled completely, spread the frosting over the top and let it drizzle decoratively down the sides. It will be thick - this is good! Sprinkle with remaining graham cracker crumbs. Let frosting set, then serve!